Coach's Corner Volume 11 - The Red Zone Radio Show pioneered coaching talk shows when it began "broadcasting" in 2009. In this edition of Coach's Corner, host John Anderson talks with Coach Big B of the Red Zone Radio Show about a variety of topics, including the evolution of his Red Zone Radio and its most popular shows. John and Coach Big B talk some football X's and O's as well. 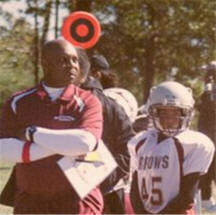 Coach Big B - Bernie Hayes - Founder of The Red Zone Radio Show with Coach Big B and Youth Football Coach in the Washington D.C . Coach Hayes pioneered coaching talk shows when he began "broadcasting" his Red Zone Show in 2009.